JET PILOT is prime Bad movie, a John Wayne wanker worth a look for yocks at its awfulness. It’s a Howard Hughes fiasco that started filming in 1949, then with directorial changes went on adding material for four years. Still unsatisfied, Hughes endlessly dinked with it until 1957 before letting its by-then out-of-date flying sequences loose on the screen. The fighters bombed, as it were, returning only $1,400,000 on the $9,000,000 HH squandered. 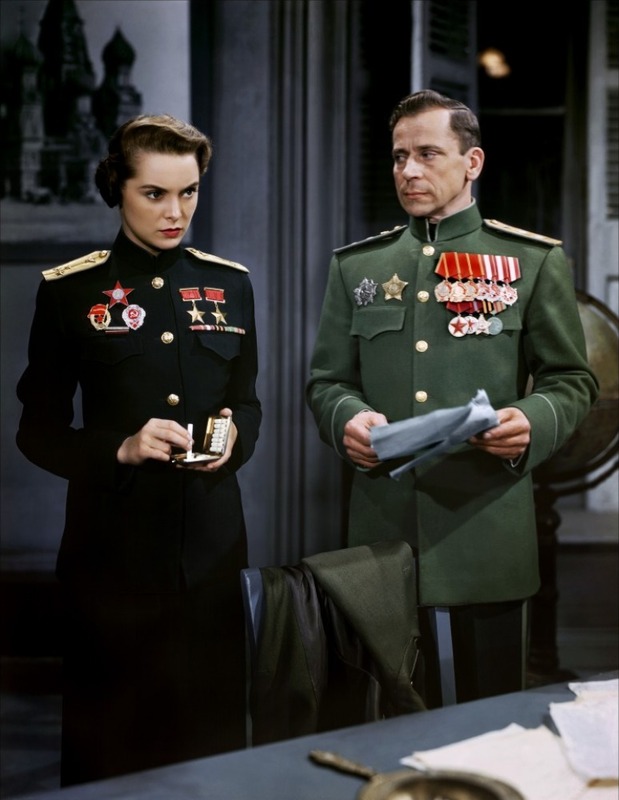 Ostensibly a Cold War drama (“too stupid for words”, Wayne is quoted) but half of it is played like a romantic comedy ala Ninotchka, what with Air Force officer Wayne guarding a Russian defector/ace pilot/spy/bombshell, Janet Leigh (and then some). She in turn unleashes her inner vamp upon the red-blooded Yank to lure him to the USSR. Nefarious Stalinist scamp! What makes you think I would reveal anything? Bad lines abound, with situations dumb enough to resemble actual Pentagon involvement. Leigh, in typical Hughes-Meets-Breasts fashion, is outfitted and posed to give optimum thrust to her sonicly booming fuselage (hey, blame the movie, I’m just reporting here). You calculate the innuendo with a line like “We both believe in uplifting the masses.” Janet looks like a zillion, but, holy Minsk, what a cheese-whiz flick. Directed (mostly) by the imperious Joseph von Sternberg, who hadn’t been at the helm for nearly a decade. He was hired, fired, rehired, then refired. Wayne and Leigh suffered under his unpleasant manner. It logs 112 minutes, with the bemused participation of Jay C. Flippen, Paul Fix, Hans Conreid and Roland Winters. One of the pilots in the cumulous high stack of flying material—shot all over the west—was Chuck Yeager. “Wave of the future” Howard would screen this Red-nosed toy of his over and over, for years after, all by his lonesome.